Atypical Mycobacteria or MOTT (Mycobacteria other than Tuberculosis) or NTM or Atypical Mycobacteria or Environmental Mycobacteria are a very large category of bacilli constituted by over 50 free-living species. There are ubiquitous in the environment especially in water and soil but also in domestic and wild animals and foods. These are all rod-shaped bacilli, likely the M. Tuberculosis and the M. Leprae (the first common types of pathogenic mycobacteria).1 They have pathogenic role especially in immunosuppressed patients. The number of identified and cataloged NTMs has been increasing rapidly, mainly due to improved isolation and identification techniques3: now they are categorized primarily on the basis of growth rate (rapid or slow) or type of clinical syndrome produced by the individual species. Is the most common presentation of NTM. MAC, M. Kansasii and M. Xenopi are the most frequent pathogen causing lung disease in USA and Europe. People affected are usually older adults or children with cystic fibrosis. Signs and symtomps are variable and nonspecific. They include chronic cough, sputum production and fatigue. During advanced disease can also occurs also dyspnea, fever, hemoptysis and weight loss. These condition include COPD associated with smoking, bronchiectasis, previous mycobacterial diseases, cystic fibrosis and pneumoconiosis. Radiographic features of NTM lung disease have some differences from the M. Tuberculosis pattern: in the second one there are thin-walled cavities and less surrounding parenchymal infiltrate, there are also less bronchogenic but more contiguous spread of disease and produced more involvement of pleura.7 They occasionally produce a dense pneumonic lesion or a solitary nodule without cavitation. The pleural effusions is rare. Some HRCT studies have described multifocal bronchiectasis in up to 90% of mid and lower lung field noncavitary disease with MAC infection. Actually the species-specific skin tests are not used in clinical practice due to the lack of standardized and more specific reagents. Essential for diagnosis is the cultural examination but we must consider that the contamination of the cultural material from the environment is common, so a single positive sputum, especially with a small number of organisms is not sufficient to diagnose NTM disease. The diagnosis is based on the combination of different results: is usually not difficult if a combination of clinical, radiographic, and bacteriologic criteria are used. AFB smear, culture results, and clinical status suggest a close correlation among the three. Minimal evaluation should include three or more sputum for AFB (Acid-fast bacillus) and efforts to exclude other confounding disorders such as tuberculosis and lung malignancy. In most patients, a diagnosis can be made without a lung biopsy. Although criteria are based on experience with M. avium complex, there is no reason to believe these criteria would not be applicable to other species. The diagnostic criteria are presented in Table 2. NTM lung disease is considered to be present when one or more sputums or bronchial washes are culture-positive for NTM, even if they are negative for AFB on smear and result in light growth on culture. Is the most common presentation in children between 1-5 years old and it involves the submandibular, submaxillary, cervical or preauricular lymph nodes. It rarely affects adults except in HIV infection. Generally it occurs unilaterally and not tender and occasionally it involves nodal groups outside of the head and neck. No commercial NTM skin-test material is currently available for clinical use, and this procedure is not recommended for diagnosis of NTM. There is a substantial difference on culture-proved mycobacterial lymphadenitis between children and adults, in children only the 10% is due to M. Tuberculosis, the remainder is due to MAC and M. Scrofaceum. In contrast, in adults more than 90% is due to M. Tuberculosis. Most frequent pathogens that cause infections of the skin and soft tissue are M. Fortuitum, M. Abscessus, M. Marinum and M. Ulcerans. However, virtually all species of NTM can be a cause of cutaneous disease. Localized drainage or abscess formation at the site of puncture wounds (such as occurs after stepping on a nail), or open traumatic injuries or fractures are most often due to the rapidly growing mycobacterial species M. fortuitum, M. abscessus, or M. chelonae. Mycobacterium marinum is the cause of “swimming pool granuloma” or “fish tank granuloma” or by scratches or puncture wounds from salt water fish. The lesions usually appear as papules on an extremity, especially on the elbows, knees, and dorsum of feet and hands, progressing subsequently to shallow ulceration and scar formation. Drug treatment of the disease has been disappointing; surgical debridement combined with skin grafting is the usual treatment of choice. Methods used for digestion and decontamination of clinical samples to recover M. tuberculosis have also proved useful for the NTM. Staining and microscopy of the NTM also follows the guideines used for M. tuberculosis. Both conventional basic fuchsin method (Kinyoun stain) and the fluorochrome method (auramine stain) are effective in recognizing NTM in clinical material, with the fluorochrome method being preferred.5 The appearance of NTM by microscopy is generally indistinguishable from M. tuberculosis. At least three respiratory (sputum) cultures should be used for the initial evaluation. Cultures should be inoculated onto one or more solid medias and into a liquid medium. Use of solid media as the primary or sole culture is no longer recommended given the greater recovery rate and more rapid recovery of all Mycobacteria, including M. tuberculosis, in rapid broth systems. Two general types of solid media are available: egg-potato-base media (commonly, Lowenstein-Jensen agar) and a clear agar-base media (commonly, Middlebrook 7H10 or 7H11 agar). Quantitation of growth on agar plates (generally 0 to 4+) is important to estimates of clinical significance and responses to therapy, and it is recommended for all samples other than blood cultures. Mycobacterial blood cultures may use a single medium, with the BACTEC 13A broth or the lysis centrifugation method with plating on 7H10 or 7H11 being the recommended methods. The broth medium can involve one of several automated commercial systems, including radiolabeled and nonradiolabeled systems. For lower volume laboratories, the recently introduced mycobacterial growth indicator tubes with a fluorescent detection system or biphasic agar/ broth may prove more practical. Most slowly growing NTM produce detectable growth in 2 to 4 wk on the solid media and in 1 to 2 wk with the BACTEC system. Cultures are generally incubated at 35–37°C for 6 wk. All of the currently recognized NTM pathogens will grow on these media in this time except M. haemophilum, M. genavense, and M. conspicuum. If M. haemophilum is suspected, a commercial paper surface containing hemin (X factor) used to identify Haemophilus influenzae should be added to the surface of the 7H10 or 7H11 plate, or hemin or ferric ammonium citrate should be incorporated into the medium. Mycobacterium genavense often grows only from the blood in BACTEC 13A medium or comparable broth media, and requires incubation for at least 8 wk. Mycobacterium conspicuum will grow in BACTEC media at 35–37° C but will only grow on solid media at lower temperatures, 22–31° C. The presence of an AFB smearpositive sample with no growth on solid media should immediately bring to mind M. haemophilum, M. conspicuum, or M. genavense. Because of the relatively poor growth of M. genavense, molecular techniques such as polymerase chain reaction are the optimal method of identification. The major modification of culture techniques for recovering NTM species is the need to incubate all skin or soft tissue samples at two temperatures: 35° C and 28–32° C. This is because a number of the common pathogens of these tissues, including M. haemophilum, M. ulcerans, M. marinum, and M. chelonae, may grow only at the lower temperatures, especially on primary isolation. Five to ten percent CO2 enhances the growth of some NTM species, such as M. haemophilum, and should be used for primary isolation because of its definite growth enhancement for M. tuberculosis. Traditional identification of NTM, as well as M. tuberculosis, has relied upon statistical probabilities of presenting a characteristic reaction pattern in a battery of biochemical tests. The niacin test was the most useful for separating NTM and M. tuberculosis because the former is usually negative, whereas isolates of M. tuberculosis are positive. As described in the introduction, the appropriate grouping currently for these organisms is based on the type of clinical disease they produce. (Table 1). Because of the extremely slow nature of traditional biochemical tests, most clinical and public health laboratories now use one or more rapid diagnostic methods for species identification. These rapid methods are recommended for identification of the NTM when possible; they include HPLC, the BACTEC NAP test, and commercial DNA probes. The HPLC examines the mycolic acid fingerprint patterns that differ among most species or complexes of mycobacteria. A small number of species (complexes) are not separable by HPLC, including most of the pathogenic rapidly growing mycobacterial species. Commercial nonradiolabeled DNA probes complementary to ribosomal RNA are available for identifying isolates of M. tuberculosis, M. gordonae, M. kansasii, M. avium, and M. intracellulare. They are highly sensitive and specific, providing species identification using a culture directly from BACTEC broth within 2–4 h.
The BACTEC TB 460 system can be used to differentiate between M. tuberculosis and the NTM using a selective growth inhibitor called NAP (p-nitro-α-acetylamino-β-hydroxypropio-phenone). This compound, at a concentration of 5 μg/ml, inhibits the growth of M. tuberculosis complex but not NTM (with the exception of M. genavense). However, a species identification schema other than the use of DNA probes for NTM has not been worked out for use with the BACTEC, and such identification must depend on one of the previously discussed methods. Although there is not an international consensus yet, there are however, sufficient data now available to make temporary recommendations regarding when, how, and to which agents the NTM should be tested. Recommendations will differ for different groups or species of the NTM (Table 3). Treatment of infections caused by NTM is either by surgery, drug therapy, or both. Drug therapy of NTM disease is long, costly, and often associated with drug-related toxicities. The treatment regimens differ by species with the most important distinction being that between slow and rapid growing NTM. The exact role of DST remains subject of debate, in particular for slow growers. One of the reason is that there are important discrepancies between drug susceptibility measured in vitro and the activity of the drug observed in vivo. In part, these discrepancies derive from laboratory technical difficulties of DST, standardization of methods and a lack of clinical validation. Yet, with the increasing clinical importance of NTM disease, DST of NTM is again in the spotlight. Despite the fact that DST of NTM is now an established tool in the laboratory, its clinical value has been not been sufficiently studied. Natural drug resistance determines a large part of the multidrug-resistance that is commonplace in NTM. This multidrug-resistance, in turn, is a likely explanation of the limited efficacy of current treatment regimens for NTM disease. Testing the susceptibility of individual clinical isolates is of limited value for drugs to which natural resistance is to be expected. Moreover, for most drugs there is no clear correlation between in vitro activity and the outcome of treatment, in vivo. This should still be the prominent subject of research to clinicians and microbiologists involved in mycobacterial disease treatment. The influence of pharmacokinetic interactions between the various drugs and the formulation of pharmacodynamic parameters that predict outcomes should be accounted for in such correlation studies. 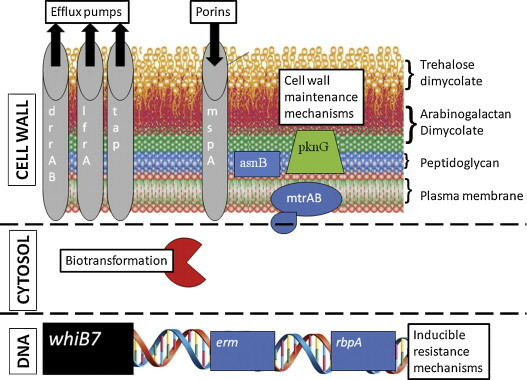 Given the importance of natural drug resistance in NTM and the treatment of NTM infections, novel therapies could use compounds that destabilize the mycobacterial cell wall and increase its permeability. The various genes and systems described in the J. Van Ingen review10 all provide potential drug targets. In addition, efflux pump inhibitors may help to improve the efficacy of antimycobacterial drugs. Various efflux pump inhibitors are known, of which the phenothiazines (notably thioridazine) and verapamil have been best studied. The phenothiazines have the additional advantage of intrinsic antimycobacterial activity, both in vitro and in vivo. Based on the courses of Microbiologia (Prof.ssa D. Savoia), Patologia Sistematica 2 (Pneumologia – Prof. G. Scagliotti), Patologia sistematica 4 (Infettivologia – Prof. A. Biglino), Medicina di Laboratorio (Microbiologia Clinica - Prof.ssa D. Savoia) and the guidelines on Diagnosis and Treatment of Disease Caused by Nontuberculous Mycobacteria of The American Thoracic Society. 3) Tortoli E. et al. Impact of Genotypic Studies on Mycobacterial Taxonomy: the New Mycobacteria of the 1990s Clin Microbiol Rev. 2003 Apr;16(2):319-54. 5) Gupta S. K. et al. Cytodiagnosis of tuberculous lymphadenitis. 1993 Acta Cytol. 37:329–332. 6) Nightingale S. D. et al. Incidence of Mycobacterium avium-intracel- lulare complex in human immunodeficiency virus–positive patients. 1992 J. Infect. Dis. 165:1082–1085. 7) Falkinham J. O. Epidemiology of infection by nontuberculous mycobacteria. 1996 Clin. Microbiol. Rev. 9:177–215. 8)Jarand, J., Levin, A., Zhang, L., Huitt, G., Mitchell, J.D., Daley, C.L., 2011. Clinical and microbiologic outcomes in patients receiving treatment for Mycobacterium abscessus pulmonary disease. Clinical Infectious Diseases 52, 565–571. 9) Lambert, P.A., 2002. Cellular impermeability and uptake of biocides and antibiotics in Gram-positive bacteria and mycobacteria. Journal of Applied Microbiology 92 (Suppl. ), 46S–54S. 10) Van Ingen J. et al. Resistance mechanisms and drug susceptibility testing of nontuberculous mycobacteria. Drug Resist Updat. 2012 Jun;15(3):149-61.